While some people call it “basic”, we call it delicious. 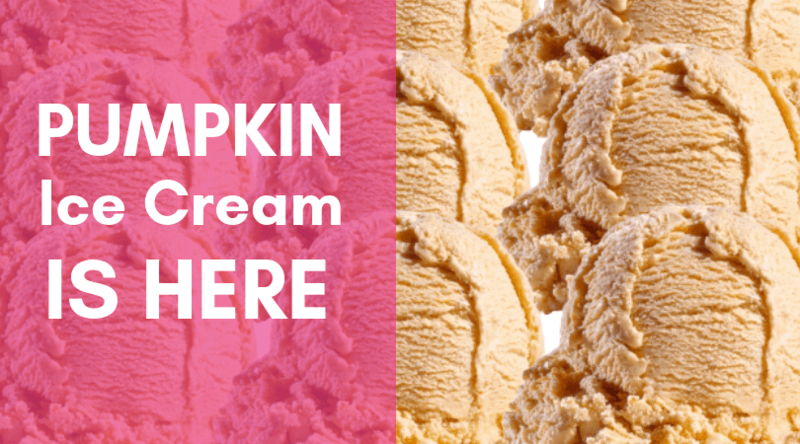 Braum’s Premium Pumpkin Ice Cream is back in time for all your fall festivities. This seasonal sensation creates excitement each fall at our stores. To celebrate, try using this perfect pumpkin flavor to spice up classic desserts. Embrace the chill of fall and ice cream with a pumpkin-themed float. This float is an autumnal twist on the classic Boston Cooler combo of ginger ale and vanilla ice cream. Be brave and treat yourself to this kooky concoction after a night of trick-or-treating. Place three large scoops of Braum’s Premium Pumpkin Ice Cream into a chilled, tall glass. Tilt the glass slightly toward you as you slowly pour ginger ale over the ice cream. Stop occasionally to let foam subside. Pour until the ale reaches about one inch from the glass’s rim. Top with optional whipped cream topping and sprinkle with pumpkin pie spice. Serve with a spoon and straw immediately. This milkshake forgoes coffee flavor to shine light on the true star: pumpkin spice. Blend this quick dessert on a cozy, autumn night in. Serve with a scary movie and blankets. In a large blender, combine ice cream, milk, pumpkin pie spice, and vanilla extract. Blend until smooth. Pour the mixture into two chilled, tall glasses. Top with optional whipped cream and dust with extra pumpkin pie spice or cinnamon. Serve immediately with straws. Thinking of the holidays already? Looking to surprise dinner guests? Try this twist on the classic pumpkin pie dessert. This pie is a perfect finish to Thanksgiving dinner. Set out the container of Braum’s Pumpkin Ice Cream and allow to soften. In a mixing bowl, combine softened ice cream and 1 cup chopped pecans. Spoon mixture into chocolate cookie crust making sure the top is smoothed. Top the ice cream mixture with chopped pecans and drizzle over caramel and fudge topping. Cover and freeze for at least one hour or until ready to serve. Can’t wait to for a scoop of Premium Pumpkin? Head to your local Braum’s for a scoop at the counter or stop by Braum’s Fresh Market for a 3 pint to take home! Check out the other recipes on our blog or in our recipes archive! No matter the season, we provide the inspiration and quality products to create crowd-pleasing treats.